I begin most years with a resolution to keep a record about the books I read and my impressions of them. I get to the end of each and every year reproaching myself the fact that I haven’t. I vow -more in hope than expectation – to be more diligent for 2019. That, and a resolution to update this blog more often. As a ballpark figure, I reckon I have read between forty to fifty books this year for pleasure, and I know from my Audible account that I have listened to fourteen. Not too shabby. In terms of genre, a lot have been non-fiction travelogues, read in order to to gin me up/guilt me into finishing my own non-fiction travelogue about the island of New Guinea (about halfway there). I’ve also read some popular history, some crime novels, more literary fiction than I normally do and rediscovered a love of Irish poetry. I remember being blown away by David Remnick’s Lenin’s Tombabout the last days of the Soviet Union when I read it as a teenager. The combination of individual stories as an entry point into wider history, the active role for the author in the story and on-the-ground reporting replete with idiosyncratic but revealing anecdotes felt perfect. Walker’s book about Vladimir Putin’s Russia is very reminiscent. It is written in a similarly engaging and ‘intelligence lightly worn’ style. He has winning descriptions: of crazed rebels, of half-finished hotels at the winter Olympics, of towns so desolate and melancholic you can almost picture the brown curtains in each home. I finished his book informed and entertained in equal measure. This is an extraordinary book about a walking journey-come-meditation on faith. Guy Stagg sets off one frigid New Year’s Day from England with the plan to follow by foot the old pilgrimage trails from England to Jerusalem. Stagg himself is without faith much of the time but there is an inner zeal that pushes him along through slippages and debilitating bouts of loneliness. Even though he did the walk a few years ago, there was something gloriously old-fashioned and timeless about this book. It was like something Patrick Leigh Fermor or Robert Byron would have written. To the best of my knowledge, I am only one of two Northern Irish who works in New Guinea and was as if this novel - set half in Northern Ireland and half in Papua New Guinea – was written especially for this rather select audience. The book tells the story of Liz Donnelly, a dissatisfied anthropologist who, following her sister’s wedding to a suspiciously well-mannered man who no obvious past, goes off to make a documentary about cargo cultism in the (fictional) island of New Ulster (geddit?!). Life unspools for them both in slow-moving car-crash fashion. Some of the reviews found this book less than the sum of its parts but I found it a deeply satisfying read. Laird gets 10/10 for getting to the underneath of things and silences of Northern Irish small-town life and comes pretty close in his New Guinea part of the book. I also read his book of poetry Feel Free, which captures so well the way that Northern Irish people construct phrases. I found this book in the remainders pile in the National Library Bookshop and handed over $10 based entirely because I was smitten by the cover, a powder blue map of the continental United States marked with little signposts adorned with the names of poets and beatnik authors (The hyperlink I found for the book is slightly different). I had never heard of Sinclair before but he is now my #2 favourite author. The book a mash-up of memoir, off-beat back stories of authors , literary meditations and diverting gallimaufries. Sinclair has a most singular and enthralling writing style. I’m hoping to read his new book on London over the Christmas break. I bought his collection of essays on the day of publication. There are twenty or so pieces: travelogues; perceptive musings on writers like Paul Bowles, Hunter S. Thompson and Somerset Maugham, an interview conducted in a helicopter with Elizabeth Taylor and another where he chews over the oeuvre of Joseph Conrad with Michael Jackson. Paul Theroux is incapable of writing an uninteresting sentence. His book was the most unabashedly entertaining boo I have read this year. I’m noodling around with ideas for a longer piece involving the island of New Guinea and expat colonies. 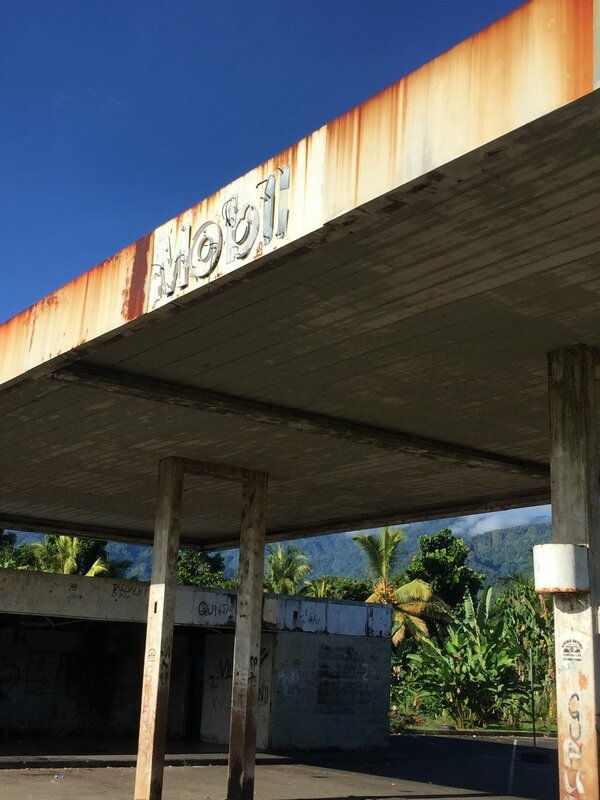 I’d love to hear from anyone – whether they be Bougainvillean or a Bougie-fogie – who lived in Arawa back in the seventies and eighties..
Part of the charm of visiting the old Bougainvillean capital of Arawa is to find the bits of Australiana that hide in plain sight. Arawa was purpose built in the 1960s to house the families of the mostly Australian miners who worked at the giant Panguna copper and gold mine located nearby. Located on the farthest shores of eastern New Guinea, Arawa resembled any small town in Australia. There were wide boulevards, playing fields, squash courts, a public library, a golf club, and even a fish and chip shop. The idyll did not last. Amidst conflict over the mine, the expat families fled Arawa in the late eighties, never to return. But the remnants and relics of their life there are still there for all to see. These days, mining is mostly a 'fly in, fly out' business but, back then, it involved the creation of expat colonies. There were direct flights from Australia, good schools, plentiful amenities and well-stocked supermarkets. Promotional videos for Arawa exude an endless Sunday vibe of beaches, barbecues and safe tropical glamour. Going by grainy cine-movies, Arawa was a place of well-demarcated gender roles during the week. Men - tight shorts and knee socks - would jump into Volkswagen vans and head off to work. Their partners - big hair and make-up liquefying in the heat - would hold coffee mornings. On the weekends, it was carefree times at the sports and social club and sub-aqua centre, washed down with beer and whiskey at the island resort. Arawa seemed a boozy, good-natured sort of place. Much of the reminiscences of the self-described ‘Bougie-fogies’ revolves around the staggering amounts of alcohol they consumed. But behind the jolly expatriate veneer was brewing disgruntlement. The Government of Papua New Guinea, which became independent from Australia in 1975, received royalties from the mine but little went back to Bougainville. Land-owners close to the mine were dissatisfied over low payments for use of the land and how the money was being distributed. Mine workers were unhappy about their terms and conditions of employment. Tensions bubbled between Bougainvilleans and migrants from elsewhere in Papua New Guinea who came in search of opportunities. Discontent mingled with underlying unhappiness among some Bougainvilleans at being part of Papua New Guinea in the first place. The response of the Papua New Guinean security forces was akin to pouring water on an electrical fire, serving less to restore order but to inflame resentment and discontent still further. The expats were evacuated from Arawa and the giant mining operation shuttered, never yet to re-open. The golf club, the sailing club, the two hotels and were looted and burnt. It was haywire: Bougainvillean writer Regis Stella described the conflict as one of ‘terrified hearts and shattered dreams’. Between 5000-20,000 people died in a conflict that ran for a decade. Under the terms of a Peace Agreement signed in Arawa in 2001 - the signatories were carried aloft on bamboo chairs to the signing ceremony - Bougainville was given special autonomy. It will hold a referendum on its future political status before 2020. Although now close to thirty years since the first pylons came down, bits of old Arawa remain. The shop has long closed but the wall painting to the side of the fish and chip shop has barely peeled. Petrol station forecourts are still etched in the colours and logos of Shell and Mobil. The squash courts are now trade stores that sell an eclectic array: everything from t-shirts of a young John Lennon to corned beef to car batteries. Bougainvillean families now occupy the former mine workers’ homes. Other parts have more of an air of decrepitude and melancholy. Down the coast at Kieta, the shell of the old Davara hotel – home to many a rip-roaring Friday and Saturday night – is intact. The hotel pool brims with water and bougainvillea grows resplendent from the balconies. The rusted swing-gate to the sports and social club remains open, as if waiting for members to return. Other parts are gone. The jungle has reclaimed the golf fairways. The once manicured resort island lies abandoned, the jetty collapsed into the sea. All that remains of the once thriving sub-aqua scene is a stenciled metal sign. But this time capsule of a town feels on a bit of an uptick. There’s a bustle and sense of money around. While nowhere near as much as sloshed around in its heyday, the money is enough to prod the economy along. This year, Bougainville Copper Ltd, the mining company who ran the mine, began making compensation payments to landowners, boosting the amount of cash in the economy. The cocoa industry is getting back on its feet with international donor support. Another source of money is more dangerous to come by: alluvial gold mining, estimated to generate at least 75 million kina (close to 25 million US dollars) per year. Bougainville’s revenue-starved government has partially lifted a moratorium on mining and exploration licenses, opening up a possibility of large-scale mining operations coming back. Arawa stands as a reminder of times before, perhaps an augury of times to come.